Laptop Memory Upgrade in Hyderabad and Secunderabad. Are you planning to upgrade your computer / macbook / laptop memory and looking for a trustworthy hardware service provider for the same and looking for best price? Laptop Repair World is the one stop shop to fulfill your any type of requirement of repairing service for Laptop or computer. 4gb, 8gb, 16gb, 32gb ddr3 / ddr4 ram for Apple, Dell, HP, Lenovo, Acer, Asus, Toshiba, Sony laptops. Adding more RAM make your computer faster. 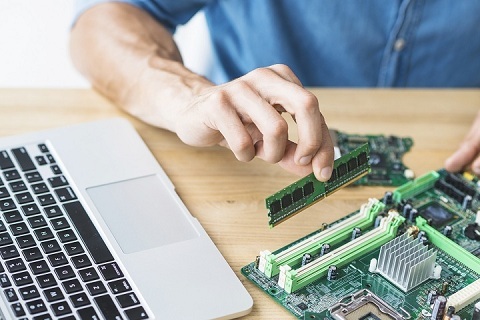 Laptop Home Service: By upgrading computer RAM, it will will boost up speed. In the Hyderabad city, there are many Hardware service providers. But our service policy and quality make the differences and some of special service features are given below. Our Service Engg will upgrade your memory or any other device or Windows without losing previous data from your hard disk. Our service procedure is totally safety and secure during resolution of your all issues. If suppose any of your computer and Laptop parts or device is not working, then we will replace the old device with a new better quality device having an appropriate warranty. So you must get assurance of best quality service with best quality components. Regarding price factors, our price and service charges will be definitely lower than other local Laptop repair service providers. We can provide you, new Laptop as well as Desktop in reasonable price by assembling with branded parts. We achieve 100% customer satisfaction for last 20 years in Hyderabad city and our motto is to satisfy customers’ need from every angle. We provide door delivery for each required device or new machines required by our customers. If the product or service will not be useful as per committed terms and conditions, we assure you of money back guarantee. This year we have celebrated the 1 Lac customer’s achievement in Hyderabad city for more than 20 years. This is our best inspiration for our customers.